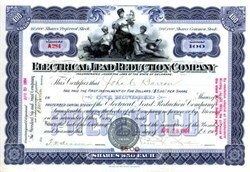 The Electrical Lead Reduction Company is a Delaware corporation, with a capital stock of $2,000,000 preferred and $10,000,000 common. Shares are $50 par value. The products of the company are lead and lead compound for storage batteries and litharge made by an electrical process. The company's plant is located at Niagara Falls, and is equipped with electrical machinery especially designed for the company. An official says that the company has about $50,000 in bank and no debts, owns its own factory, machinery, etc., without lien or encumbrance, and that the company is doing an increasing business at a large profit. Its factory is running both night and day. The Electrical Lead Reduction Company was incorporated in 1899 and produced products supporting the manufacturing of early batteries. Pedro G. Salom was the president and was an Electro Chemical Engineer. Pedro G. Salom was on of the co founders of one of the earliest known electric cars and of the first motor vehicle service in the United States as described below. In 1894, Henry G. Morris and Pedro G. Salom of Philadelphia constructed an electric car, producing four more of these Electrobats in 1895. In 1897, Morris and Salom formed the Electric Carriage and Wagon Company, which ran twelve electric cabs on the streets of New York City under the name of the Electric Vehicle Company. This was the first motor vehicle service in the United States. The company's electric taxicabs were intended to compete with the horse-drawn cabs then in service on the streets of New York City. Morris and Salom's strategy was based upon the model of livery stables that leased horses and carriages by the trip, by the day, or even by the month. The Electrobat was the first successful electric automobile. It was designed and built in 1894 by mechanical engineer Henry G. Morris and chemist Pedro G. Salom in Philadelphia, Pennsylvania. Both had backgrounds in battery streetcars and, as the battery streetcar business was fading, they teamed up to make battery road vehicles. Their effort was patented on August 31, 1894. Built like a small version of a battery streetcar, it was a slow, heavy, impractical vehicle with steel tires to support the immense weight of its large lead battery. It entered production in 1895. In 1896, Morris and Salom founded the Morris & Salom Electric Carriage and Wagon Company, evidently the first electric car company in America. Subsequent versions were lighter and had pneumatic tires, with bodies built at the Caffery Carriage Company in Camden, New Jersey. These cars steered by their rear wheels and had two 1.5-horsepower (1.1 kW) motors that propelled them 25 miles (40 km) per charge at 20 mph (32 km/h). Morris and Salom went on to build about a dozen Hansom cabs based on this vehicle, to compete with the horse-drawn cabs then in service in New York City; they operated in New York, Boston, and elsewhere. They sold the cabs and their concept to Isaac L. Rice, who reincorporated the enterprise as the Electric Vehicle Company (Elizabethport, New Jersey), in 1897, and later became part of Pope's empire. Pedro G. Salom was also the first Treasurer of the American Electrochemical Society elected at its first meeting held at the MANUFACTURERS’ CLUB in Philadelphia on April 3, 1902 which was attended by 52 of the 337 charter members.